The art of tattooing has been around for tens of thousands of years, and it can be found as a component of nearly all cultures throughout time. This ancient past as well as the continuous uprise in the popularity of tattoos over the past century has brought about many different tattooing styles that we see in practice today. 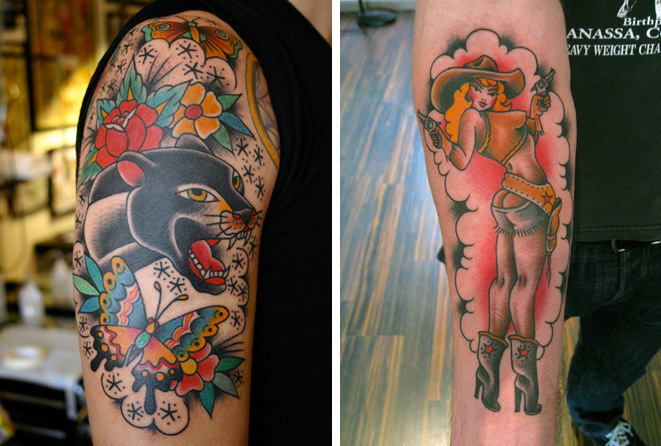 Here we have listed tattoo styles and New York artists who specialize in them. Japanese tattooing is thought to have originated around 10,000 BC as a form of spiritual commitment and has progressed to full-bodied tattoos made with wooden handles and metal needles attached via silk thread. Today, artists who specialize in Japanese typically use a regular tattoo gun and needles, though the traditional practice is still in use. Japanese tattoos are usually large pieces with bold, thick colors, and heavy black. Subject matter of the tattoos usually revolve around Japanese motifs such as koi fish, samurai, geisha, tigers, cherry blossoms, waves and dragons. Often referred to as “Old School” (or Old Skool) tattoos, traditional American tattoos originated during the end of the 19th and beginning of the 20th century. Commonly recognized by simple 2D images and uses of thick black outlines and filled with solid reds, greens, and yellows, traditional tattoos (often associated with names like Sailor Jerry and Ed Hardy, who tattooed in the traditional style) have become a staple in the tattoo community. Neo-traditional (referred to also as new traditional) is a new take on an old classic. Neo-traditional veers its use of design to create a more artistic adaptation from previous traditional tattoo designs bringing it new life. Military and nautical themes are common among traditional tattoo designs such as swallows, hearts, banners, pin-up girls, anchors, daggers, and snakes. 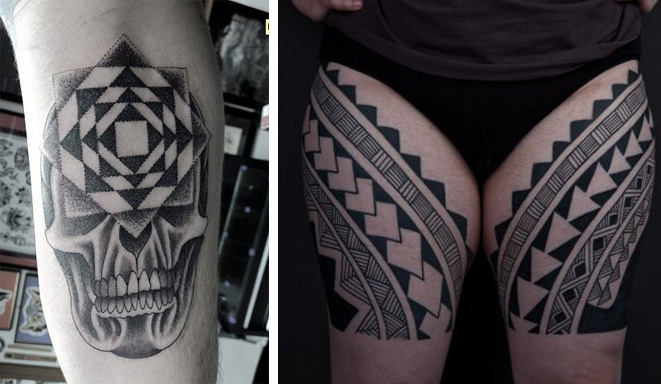 Most commonly thought of as thick solid black intertwining designs, tribal tattoos originate from tattooing styles of the Aztec, Samoan, Polynesian, Indian, Hawaiian, Egyptian, and other cultures. Originally used as a symbol of social status or identification, tribal designs have morphed into a more decorative aspect. These tattoos, done in black, can take on the form of basic organic designs or also often in the form of animals and typically designed to work with the shape of the body. Although people have always been tattooing faces and images, the art of photorealism and portrait tattooing are new and upcoming fields. These tattoo artists must be especially talented in their ability to truly capture the essence and characteristics of a person. 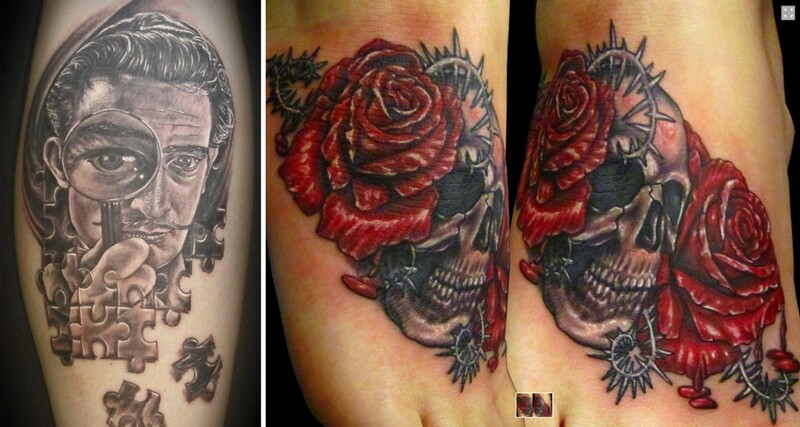 Not only that, but portrait tattoo artists usually specialize in either black and white portraits versus color portraits which add an additional dynamic to the portrait tattoo style. 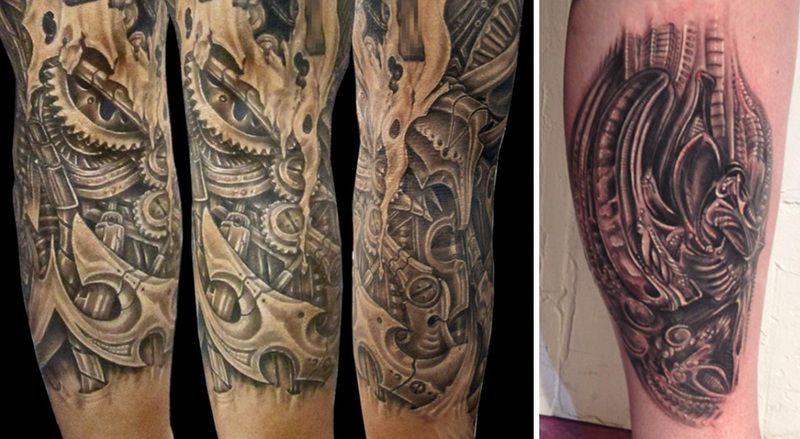 Biomechanical tattoos are unique by themselves in the way they incorporate skin and tattoo. A biomechanical tattoo is specifically designed to work with the body and appear as it was integrated in the skin with depth and a 3-D like affect. The final product usually looks as if skin was removed to reveal what truly lies underneath. Biomechanical tattoo designs feature robotic parts that combines elements of machinery with organics. One of the most common types of tattoos seen today is simple script or lettering. Script has a larger range of stylistic properties than most people think with the size, placement, and movement of the words with the body. Not to mention the possibilities with all of the different languages and font choices. People can often express themselves through script in ways some images cannot. This is one of the newer yet more up and coming approaches to tattooing, artists who specialize in this modern style adapt visionary and modern art into tattoo designs not often previously seen. Using bright, strong colors and organic designs to work with the body and create an inspirational artwork rather than merely tattooing an image on the skin. It is not all about specific method or style. Horror tattoo artists specialize in a different way by focusing on bringing that of fiction and the big screen to reality with realistic interpretations of our favorite horror and thriller villains and victims. There are also artists who designs tattoos with only satanic and occult subject matter in mind offering a different perspective on the dark and supernatural. This entry was posted in Tattoo Ideas, Tattoos, Thoughts.